Storm windows are a very important consideration when building or remodeling a home, or when window replacements are wanted. 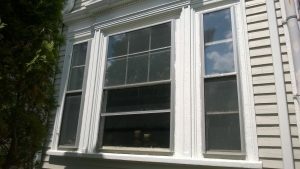 Storm windows are essentially specialized windows mounted either behind or in front of the regular windows in a house, and provide additional insulation from outside temperatures and extreme weather. We provide the best storm windows Houston can offer for your home and businesses throughout the greater Houston area. Reliant Construction will install any size storm window. While properly fitting and insulated windows go a long way to regulating the indoor temperature of your home in the unpredictable Houston weather. Temperatures can reach an excess of 100°F in the summer and drop below freezing in the winter, so it's very important your home is well insulated. Heating and cooling costs can reduce, and some clients have even stated that their homes are less dusty because their windows are properly sealed. In addition to these fluctuating temperatures, Houston's location near the Gulf of Mexico means that the area is subject to thunderstorms and the occasional hurricane. Storm windows, as the name implies, help to protect your home during periods of high winds and air pressure by providing a more resilient layer between the weather and relatively delicate glass window panes.